With automated systems, self-driving cars, and robot helpers on the horizon, the way in which we interact with technology is going to undergo another massive shift. We might not have everyday access to these technologies now, but we will soon. But for that to happen and for these technologies to succeed, people have to want to use them. We’d have to fully accept them. To that end, advertising agency Dentsu, teamed up with the University of Tokyo’s Research Center for Advanced Science and Technology, Robo Garage, Toyota, and JAXA (Japan Aerospace Exploration Agency) to study ways of improving human-robot interaction. Their collaboration produced a talking companion to accompany astronaut Koichi Wakata into space and another backup that stayed on Earth. The goal? Simply to keep Wakata company on his trip. The thought of going into orbit might initially sound like an incredible experience but it’s easy to forget that a regular ol’ 18-month stay onboard the International Space Station can get lonely. A year and a half off planet is a long time. “What we’re really interested in is that human-robot interaction is an inevitability within the context of the Internet of Things, Virtual Reality, robotics… all of the difficult spaces in which people are communicating,” Nigel Morris, CEO of Dentsu Aegis Network Americans & EMEA, told TNW. To help it achieve its ends, Kirobo was equipped with voice recognition, natural language processing (NLP), speech synthesis and a facial recognition camera, among other abilities. One of the potential applications for the research is helping the elderly and disabled populations in the UK and US, and the growing number of people living alone. But if its ultimate application is looking at something like ‘companionship’ for people on their own, why send a robot into space at all? 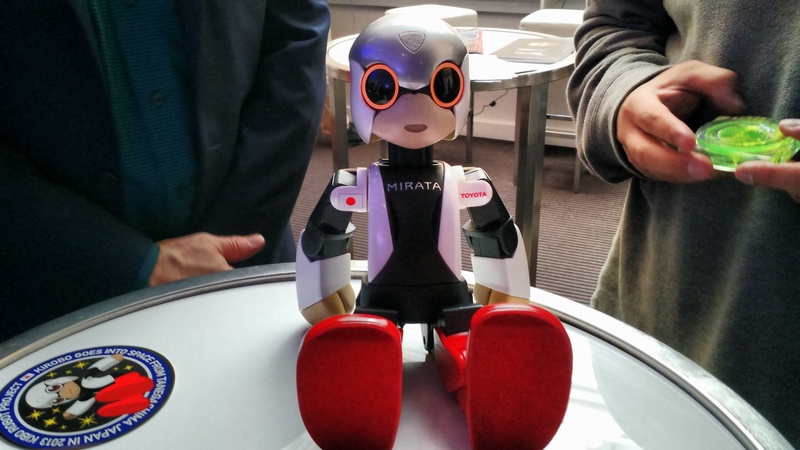 “[The] project launched five years ago, when nobody believed in human beings and robots co-existing. From that [perspective] we wanted to send it into space to show that robots and human beings… can go into a new era. 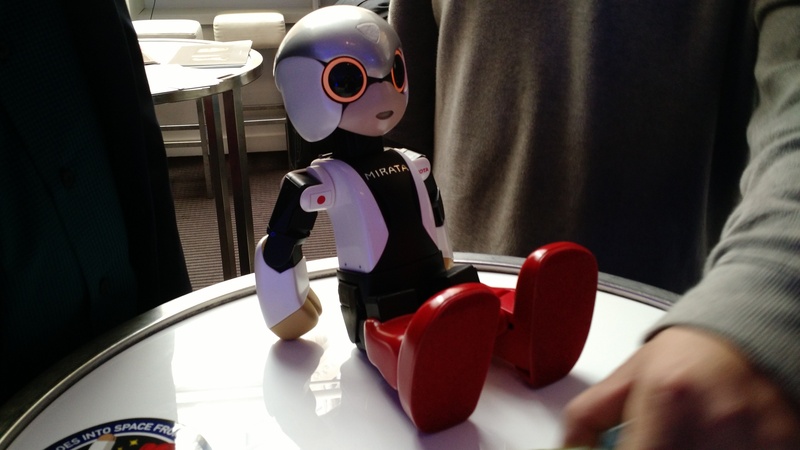 It’s a sort of symbolic project so people can understand how people can interact with robots,” Yorichika Nishijima, Communications Designer on the Kibo Project explained to TNW via Akimasa Baba, translator and Representative Officer for Dentsu London. The second reason for sending the robot into space was that it provided an extreme environment in which the robot could be stress tested. As he was designed specifically for this function, he’s actually a little more stable in zero gravity than he is on the ground. Of course, if the future of human-robot interaction is going to be a happy one, the robots will need to look friendly and approachable. That’s why Kirobo and his stand-in Mirata look kind of cutesy. 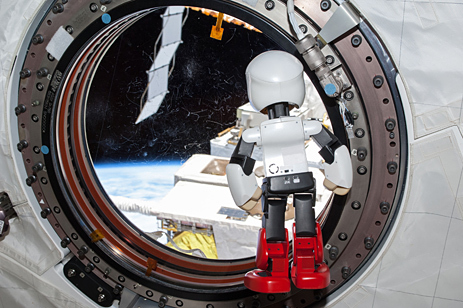 Kirobo successfully completed his mission in February this year, coming back to Earth after having been delayed from returning at the end of 2014 as originally planned. Mirata is Kirobo’s Earth-bound twin; a backup had Kirobo gone wrong. They are nearly identical though, measuring around 13-inches and weighing about 1 kilogram. It costs a lot of money to send one kilo into space, so weight was a key consideration for this project. But given that it was about the quality of the interaction and not of the robot itself, what did the team learn for the future? “In a broad sense, the next step is to understand more and more [communication] and to input some ideas from a broader commercial perspective. A key thing is that there is no defined destination, other than we think it’ll have a wider societal and cultural benefit as well as a business benefit,” Dentsu’s US and EMEA CEO Morris told TNW. The business upside could come in the form of data, as well as a deeper understanding of human-robot interactions. While the project is grounded in technology, it’s also about psychology. The study of non-verbal communication has just become machine-human communication, in this case. “The way that brands and businesses interact with people, the way in which we increasingly try and understand what it is that people want and then make it for them, as opposed to make stuff and then sell it. There’s going to be even more understanding of how people interact; the more that we can understand about the way people engage through non-human channels, the better we are going to be able to meet their needs,” Morris said. It seems that in terms of communication, we’re just about catching up to the ‘robots’ of the 1980s. KITT and Jonny 5 were both pretty good on the human interaction front. Terminator, less so. We not might be at the point of having a conversation with AI as in the movie Her, but it’s good to know research is being funded towards better communications with robots, rather than just focusing squarely on Darpa’s scary robot dogs and their potential for winning brick tossing competitions.